Best moment ever! My dog, Marlia Jain saved another dog’s life. Our patient had hemolytic anemia, a potentially life-threatening disease in which an animal’s immune system destroys its own red blood cells. She was very pale, pretty much white/blue and she was incredibly lethargic and could barely had enough energy to lift her head. She needed a blood transfusion to survive. 1 week later the dog is doing great, playing and back to herself. MJ is officially a Canadian. No that there was ever any doubt! Anemia is not a specific disease but rather is a symptom of some other disease process or condition. Anemia is a medical term referring to a reduced number of circulating red blood cells (RBC’s), hemoglobin (Hb), or both. Hemoglobin delivers oxygen to the cells and tissues of the body, and a patient who is anemic will suffer from symptoms related to a lack of oxygen. Normally, red blood cells are produced in the bone marrow and then released into the circulation. As the red blood cells age or become damaged, they will be removed from the circulation and will be recycled to form new red blood cells. The number of circulating red blood cells may become reduced if there is a decrease in production of them in the bone marrow, or if there is an increased loss of them from the circulation. Autoimmune means an immune reaction directed against the self, while hemolysis comes from the Greek words ‘hemo’ meaning blood and ‘lysis’ meaning to break open. Autoimmune hemolytic anemia (AIHA) is an immune system disease in which the body attacks and destroys its own red blood cells. In dogs with AIHA, red blood cells are still being manufactured in the bone marrow, but once released into the circulation, they have a shorter-than-normal life span. With primary AIHA, the dog’s immune system is not working properly and it incorrectly makes antibodies that target its own red blood cells. 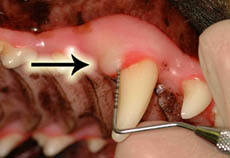 In dogs, it is estimated that about three-quarters of cases of AIHA are primary. With secondary AIHA, the surface of the red blood cells becomes altered by an underlying disease process or a toxin. The dog’s immune system then recognizes the altered red blood cells as ‘foreign’ invaders that must be destroyed. Secondary AIHA may be triggered by cancer, infection, blood parasites such as Babesia (see our handout on Babesiosis), drug reactions, snake bites (see handout on Snakebite Envenomization), chemicals, toxins, or bee stings. In dogs, neoplasia or cancer appears to be the most common cause of secondary AIHA. Most dogs with AIHA have severe anemia, and their gums will be very pale rather than the normal pink to red color. Dogs with anemia will be listless and will tire more easily; these symptoms occur because there are not enough red blood cells to carry oxygen to the tissues. The dog may faint or appear disoriented due to low oxygen levels in the brain. To compensate for the lack of oxygen to the tissues, the heart will beat more rapidly and the patient will breathe more rapidly. As the disease progresses, excessive levels of bilirubin, a breakdown product of red blood cell hemolysis, build up within the body. Some of this excess bilirubin spills over into the urine, causing it to appear dark. Excessive levels of bilirubin cause the skin, gums and other mucous membranes to appear yellow or jaundiced. The dog may vomit or may have a poor appetite. Anemia is diagnosed by performing a blood test called a Complete Blood Count (CBC). 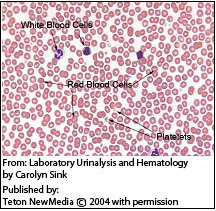 The CBC measures a number of different values in a sample of whole blood. To test for anemia, the packed cell volume (PCV) will be measured to determine the percent of red blood cells in the sample, the number of red blood cells will be counted, and the cells will be examined under a microscope to determine their size and shape. With AIHA, both the number and percent of red blood cells will be low and the size and shape of the cells will be abnormal. In many cases of AIHA, there will also be evidence of ‘autoagglutination’ or abnormal clumping of red blood cells. If AIHA is suspected, your veterinarian will also recommend additional diagnostic tests to determine whether the disease is primary or secondary. 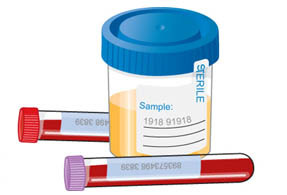 Tests may include a reticulocyte test to detect the number of reticulocytes (immature red blood cells) that are present in the bloodstream, antibody tests such as a Coombs test, and serologic blood tests to detect certain parasitic diseases. Your veterinarian will recommend additional tests to evaluate the overall health of your dog and to detect any underlying cause for secondary AIHA. Recommended tests will usually include a biochemical profile, a urinalysis, x-rays of the chest and abdomen, and an abdominal ultrasound examination. Depending on your pet’s individual results, other tests may also be recommended. If your dog’s anemia is so severe that it is life-threatening, a blood transfusion will be needed. Before giving a transfusion, blood samples will be taken for diagnostic testing. The main purpose of a blood transfusion is to stabilize the dog while the underlying cause of the anemia is determined and other treatments can begin to take effect. ← NOW OFFERING CUTOM FIT SUPPORT BRACES.